"The purpose of a university is to advance the knowledge of the communities it serves, and to help prepare their young people to make their own contribution to the common good. This cannot happen in isolation; communication with the very many people who support and benefit from our work is a core function of this University, as can be seen from the huge range of engagement activities we undertake. Our intention is to broaden and deepen our links with our communities, to confirm Brunel as a highly valuable, well-connected and respected element in their social, economic and intellectual fabric." "Brunel has always been an institution firmly engaged with the wider world. Whether by producing graduates ready for their future careers, well equipped for the world of work, or by pursuing research addressing major societal challenges, we ensure that our academic activity benefits society. We are therefore delighted to support the NCCPE by signing their manifesto, confirming our intention to communicate the findings of our research and scholarship to the public." At Brunel University, we are fully committed to public engagement. We have established it as a priority across our organisation, research and teaching. Well@Brunel works with charities (both local and national) to raise awareness of a range of issues amongst staff and students at Brunel. Volunteering opportunities in local community – Building relationships with 100 local charities to provide opportunities for staff and students to volunteer. Over 7,000 hours of time volunteering by Brunel students over last year. School and College visits, Open days, Campus tours, Personalised tours and Applicant days. We reach 15,000 people every year. Brunel Good Neighbour: annual scheme which recognises positive neighbourly relationships in the local area. Nominations are received from local community members and then prizes are awarded to both the student and the local resident that nominated them. 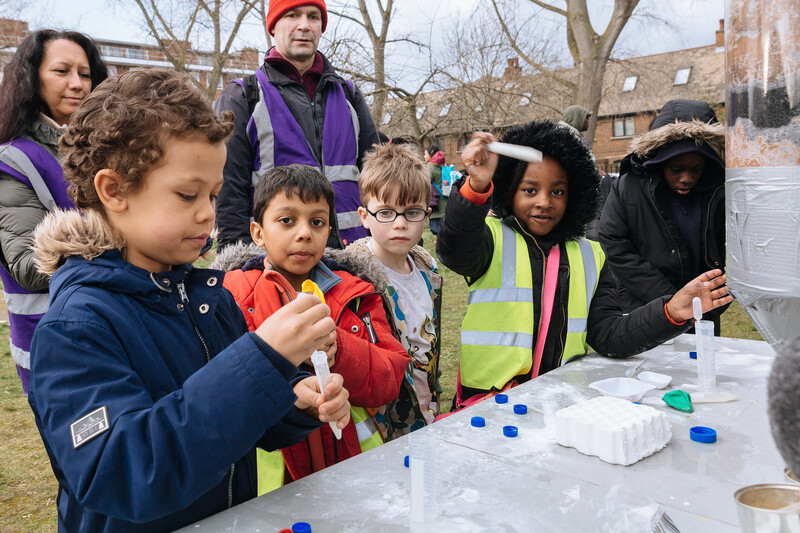 An area of our public engagement which is very exciting to us is examining how we can explore fundamental science with the public by collaborating with the world of the creative arts. Our Public Engagement champion, physicist Professor Akram Khan, joined Sci-Fi author  SF Said  in conversation at the  Hay Festival. In an event called Black Holes and multi-verses: Where science and fiction collide, they explored the interaction between the works of the narrative imagination and cutting-edge cosmic science. For Prof Khan, it is a guiding principle in his approach with his students to stimulate their creativity and cultivate their imagination in their learning through encouraging engagement with relevant works of the literary imagination. Professor Akram Khan recently returned from the  Bradford Literary Festival, where he participated in three seminars. He explained: "At CERN, we are beginning to look at articulating science using techniques deployed in a range of artistic expressive modes – it’s another thread in the tapestry of understanding reality." Getting people engaged in science is vital to Prof Khan: "It’s beautiful to see an engaged audience. Challenging ideas is what excites scientists; we love embedding seeds of doubt in people’s minds." The increase in both emphasis and scale of public engagement with research is undoubtedly a positive thing and of course why Brunel supports the NCCPE and its work. However the next area of focus must be on evaluation of the engagement activity that takes place. There is of course a growing body of academic work on just this subject but the breadth of the forms and channels of public engagement activity means that we have probably only just scratched the surface. In order for Public Engagement to be truly successful we must all look to evaluate our activity appropriately and to share that knowledge openly. It is only through the development of a significant evidence base that we will utilise public engagement funding effectively and by that I mean that we engage in ways that the public recognise and find engaging and in turn develop a true understanding of the contribution that our Universities and their research make to society. Professor Akram Khan is a world-leading researcher in the areas of fundamental and applied science and is the Public Engagement Champion at Brunel. Akram not only focusses on his specific research area but champions the cause of public engagement across Brunel University London, including leading on our highly successful partnership with the Cheltenham Festival but also on exciting projects such as his inter disciplinary work with renowned contemporary writer and thinker Will Self.